As someone who has lived with a dachshund (or wiener dog, which is the term that I prefer to use) in Glendale (a suburb of Phoenix) for over twelve years, I'm confident that she just loves it there. She's never seen snow, and never will, and I often see her out in the backyard, sunbathing when the temperatures are well over 100. So of course it's got me wondering what life would have been like being a wiener dog in old-time Phoenix. This is just a guess, but I like to consider it an educated guess! 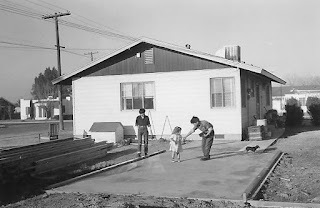 It's 1953, I'm a wiener dog, and I'm helping my family with the slab for their shed next to their house. It's just a concrete slab, and I had to stay off of it when it was wet, but now I can stand on it. Just think how cute my little paw-prints would have been on it! Oh well. It's a warm day, which I like, and my humans are inspecting the concrete slab. I, of course, am keeping an eye out, which I'm sure that my humans appreciate. Wait - I think I smell something! Not that it really matters to me, but this neighborhood sure has been growing! There are houses everywhere. If I understood any of this I'd know that the housing boom started after World War II, and that there was a terrible shortage for a long time, but now that it's the fifties, houses are being built with amazing speed. Seems to me I remember chasing after jackrabbits not too long ago. Or were they chasing me? I guess a little bit of both. You know, if Phoenix keeps growing like this... waitaminute, was that a lizard? Hang on - here I go! 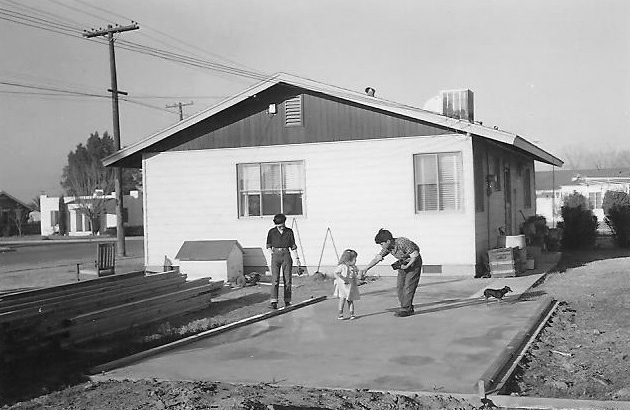 Image at the top of this post: 1330 E. Sheridan in 1953, Phoenix, Arizona. And a wiener dog.